This morning we had our first design meeting with the house builder, Trivselhus. We talked about our different choices and even made some choices in regards to inside doors, baseboards etc etc. The majority of our choices we have still to make though. We have plenty of things on our to do list to research. The next big thing is to design the kitchen with kitchen supplier. I anticipate that will happen sometime in June. We’re still waiting for them to have everything in order so we can apply for our building permits. That will hopefully be ready for submittal at the end of May and then we just have to wait. The approval can take up to 10 weeks apparently but most often it’s approved within a month. As all this happens during the summer months we’ll just have to wait. Could take longer due to vacation times. On our first meeting with the house builder (when we signed the contract) they gave us a binder to keep all information related to the house building. 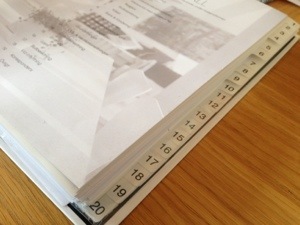 The binder also has paperwork about the whole building process, from our first meeting right up until move-in time. There are also photos of the standard items to pick from as well as the upgrades. It’s so handy to have everything in one place and as soon as we have a meeting with the builder we can just grab our binder and we’re ready to go! Sounds like a fun and exciting time in your life. Enjoy!